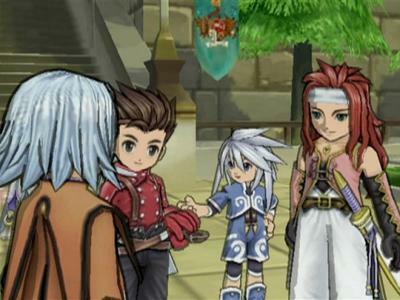 Tales of Symphonia HD Remake In the Works? Even though I am a JRPG kinda guy, I've never been a huge fan of Namco Bandai's Tales series. If I had to choose one game in the series I came closest to "liking" though, it would definitely be Tales of Symphonia, which was a GameCube exclusive in America. The PlayStation 2 port never made it Stateside, but that might change in the near future. Spanish website Koi-Nya caught up with series producer Hideo Baba and was able to get the information straight from him. Not only is the HD remake of Tales of Symphonia in the works on the PlayStation 3, but Baba also mentioned that its Wii sequel, Tales of Symphonia: Dawn of the New World, would also be getting the HD treatment. Together, the bundle will be called Tales of Symphonia: Perfect Edition. In the past, Baba has often pointed to Tales of Symphonia as the obvious crowd favorite in the series, so it makes sense that it would be the one Namco Bandai would like to revisit. Its gorgeous hand-drawn graphic style and watercolor over-world map also make it a prime choice to give an upgrade to. I just can't imagine any content being added though. I think I gave up on the quest at the 35 hour mark, realizing I was only a third of the way done. Even though the series producer has mentioned it in an interview, Namco Bandai has yet to officially comment, so treat this as a rumor for now. We will wait for confirmation of its existence before we look to find out if this game releases internationally.